Miscellanous thoughts on issues that interest, annoy or fascinate me. What I find problematic here is that the 14th dynasty (a collection of largely unrelated, many which were in power in the same time, local rulers) gets only one direct sentence and is implied in the end when the talk goes to the radiocarbon dates. The 14th dynasty mixed Egyptian and Canaanite rulers, some of which seem to have ruled parts of Sinai and even parts of southern Palestine, and paved for the day of the Hyksos 15th dynasty(1650-1540 BCE) - which itself might also not have been a dynasty in the meaning it's usually understood, although state functions could have survived when power (possibly) shifted from lineage to another. But then the Egyptian 13th dynasty(c.1800 - 1650 BCE) is itself a mix of mini-dynasties and individual rulers, who did rule in the context of a continued government (although things did fall apart in the last decades, with the kings ruling little beyond Memphis based on the geographical locations of surviving archaeological record) to which gave some shape the apparently increased power of viziers who stayed in office while one short-ruling king followed another. The 14th dynasty, which emerged in the delta - aka the central government lost power to local rulers - somewhere between 1800-1720 BCE, can be seen as setting the stage for the rule of Hyksos - and the brief Abydos Dynasty's(1650-1600 BCE) kings who were (based on their skeletons) expert horsemen, also show that the horse had been introduced to Egypt at the beginning of the Hyksos period and could thus predate them, again showing that innovations here connected to the Hyksos predated them. The problem in the now common press reports about Flat Earth believers is that either they treat the opinions of Flat Earthers as respectable - which will mislead people whose science education has not been of high enough standard - or these Flat Earthers are used as a comical material, when they are in reality a severe symptom of a disease that has infected the 'Western' civilization. Schools and media today don't educate and present science on the level and scale needed, so that these kind of beliefs would stay in the fringe territory of a few isolated crackpots. It's clear from some of the reports in the press that the journalists themselves lack basic scientific knowledge they should have learned in school. Instead many people in supposedly highly advanced countries are nowadays so scientifically illiterate that they think that a Flat Earth could be a reality. These people have been betrayed by both their states and the media. Their ignorance is not something to be snickered at, but lamented - and corrected. To some extent the Flat Earth craze also represents the larger turn to illogical beliefs symptomatic of our age, which can be said to be an age of despair. Strange cults flourish in times like ours, when people no longer feel they can control their own lives or comprehend a world that is quickly changing around them. People long towards simpler world - and in the belief on things like the on about a Flat Earth this longing has become manifest. Distrust of all authority, state and otherwise, plays a role in this. People have come to distrust authority, which no longer can offer the stable world which they need for plan their lives. If something is official, even the shape of the Earth, it must then be challenged, no matter how illogical it is. Facts are dismissed with what approaches pride. Today even amateurs can send cameras on balloons high enough up in the atmosphere to record the curvature of the spherical Earth. Yet this and the evidence everyone can see on their own eyes, like the spherical shadow of the Earth on Moon's surface during a lunar eclipse are nothing to Flat Earth believers. For this is an age of despair and theirs is not really a belief into a Flat Earth, but a way to funnel their disappointment and rage against a world and civilization which they feel has betrayed them. WHO HAS THE RIGHT TO EVOKE HOLOCAUST IN THE CONFLICT IN PALESTINE? John Lewis Gaddis has noted that much of historical thinking happens through metaphors - that something is like something else. It doesn't mean that the first 'something' is exactly the same as the second 'something', just that there is a resemblance that leads to recognition and reflection. When it comes to Israeli occupation of Palestine, both the supporters and opponents of the Israeli occupation evoke Holocaust in this manner. But if both sides could use the Holocaust as a valid comparison, it would delude its effectiveness. So in this particular case the use of past historical event in the context current political question not only justification of why one side can use it, but also denial of the other side's right to use it also. We can think of the pro- Israeli occupation Labour MP Wes Streeting both denying the Holocaust as a valid comparison to Israel's treatment of Palestinians, while evoking the Holocaust to attack criticism of Israel's treatment of Palestinians. According to this type of thinking, it's abhorrent to compare Israeli occupation to the genocide of the Jews by the Nazis and their collaborators, but it's justified to evoke the Holocaust to show a supposed fate of the Jews in Israel if the Israeli occupation is not supported and its criticism forbidden. Part of this tactic is to deny that any solution between extremes can exist: Either Israeli occupation over Palestinians will exist forever into the future, or the Jews in Israel 'will face a second Holocaust' as representatives of the Israeli Lobby so often claim. Only the Israeli occupation stands between the past repeating - effectively the occupied Palestinians armed with rocks and Molotov cocktails are exactly the same as Nazi Germany armed with the first jet-fighters like ME-262 and the V-2 ballistic missile. The basic premise is that Palestinians are all purposes the same as Nazis and to oppress Nazis is to oppose the Holocaust that took place during the Second World War. At the same time the right to compare Israel's actions to those of Nazi Germany are declared to be forbidden for being too far-fetched and too insulting to contemplate; to compare the besieged Gaza Strip to a concentration camp or the archipelago of Palestinian communities in the sea of Israeli occupation on the West Bank to ghettos is declared in itself to be Anti-Semitic in nature. This, of course, is all about the control of the narrative. Is it a story of 'self-defense' by survivors of a genocide (as the pro-Israeli occupation commentators make it) or the story of a 'resistance against colonization' by a native population against European-led colonialists whose ideology is related to the other extreme forms of nationalism that blighted Europe in the 20th century? Basically the first would put the conflict in Palestine in European and Jewish history, the second in the global history of European colonialism and the resistance and liberation from it. In the latter version, Zionism as a state ideology resembles that of Nazi Germany in its obsession of ethnic-religious unity of one group of people and the necessity of their victory over 'an inferior' group of people whose very existence is a hostile threat to the dominant group's own existence. At the heart of the question whether the Holocaust can be evoked in the context of the conflict in Palestine and who can evoke it is this battle of the narratives and the debates over it must be seen as part of the larger argument about the conflict itself; what is basically lacking, interestingly, is any kind of centre that would deny both sides the the right to make comparisons to the Holocaust. In essence, the right to use the Holocaust in the context of the conflict in Palestine is not denied, what separates people is the question who has the right to use the Holocaust comparison. This shows important the past is understood to be in attempts to make the present understandable to contemporaries and to sway their thinking. Gaddis, John Lewis: The Landscape of History: How Historians Map the Past(2002). THE IRON AGE KINGDOM OF PALISTIN: 'NORTHERN PHILISTINES' IN SYRIA AND TURKEY? [Kay] Kohlmeyer, aware of the find's political implications in a country with 400,000 Palestinian refugees, downplays the inscription's significance. "I worry that this could become a pilgrimage site for Palestinians," he says. Andrew Lawler: Temple of the Storm God(2009). Discoveries in this century have led to a radical transformation of the political history of early Iron Age Syria and southwest Turkey, by revealing an important kingdom possibly connected to the Philistines: The Kingdom of Palistin, emerging from a neglect of 27 centuries. Although the evidence for the kingdom have been slowly growing since the excavations of Tell Tayinat in the 1930s and discoveries such as the Meharde(1959) and Sheizar(1979) stelae, it was not until this century that advances in desciphering the Luwian language inscriptions led to the realization that the obscure Syro-Hittite kindom, whose name was believed to be Padasatini or Wadasatini was instead the kingdom of Palistin (later Walistin) and this, in connection of the rich Mycenaean-style pottery made from local materials at its capital at the beginning of its existince, led to a now widely accepted theory that at least the name of the kingdom came from the Philistines. Its possible, but far from proven, that the entire polity might have had its origin in founding by Philistines, who would have mixed with locals and adapted Syro-Hittite culture, religion, symbols of rulership and soon also names. In what follows we will try to give a quick overview of what has been discovered and in the very end we will try to show the connections and importance these finds have with the modern Palestinian struggle for liberation from the Israeli occupation and fullfillment of the right of return. In the early 12th century the Hittite empire of Hatti, which had ruled current Turkey, Syria and parts of northern Iraq and Lebanon, collapsed. The last dated text that seemingly references the empire as still in existence comes from 1192 BCE. At the same time the great Mycenaean citadels in mainland Greece fell one after another. Greece experienced a collapse of level of culture, not just states; the art of writing was lost for four centuries. This was the Late Bronze Age Collapse that witnessed political fragmentation, lower levels of urbanisation, population and trade in the eastern Mediterranean and the Near East. To this was connected the apparent immigration of the so-called 'Sea Peoples', connected to collapse and abandonment of states and city-states large and small, and speculated to be drawn from both near (Cilicia, Greece) and far (Sardinia, Sicily). This heralded the beginning of the Iron Age in the eastern Mediterranean, which for centuries was a lesser age for much of the area; the Assyrian empire experienced brief re-expansion under Tiglath-Pileser I(1115-1075 BCE) followed by confinement to its core areas and Cyprus flourished as its competitors in the trade networks of the area were reduced or lay in ruins. Egypt, while at first appearing to stand as an island of stability in the turmoil around it, started to decline in the 1140s and after the death of the last Ramesside king Ramses XI around 1070 BCE was, in reality but not in name, divided in two parts with its empire in Syro-Palestine and Nubia lost. The centuries from 1200 BCE to 900 BCE have thus been called 'a Dark Age' because of the apparent retreat of higher civilization and political, state-level formations, of which Greece is only the extreme example. In the Near East much of this period has been 'silent' because of the limited number of surviving texts. In the Amuq plain on the border of modern states of Turkey and Syria a population with Aegean connections seems to have settled the long abandoned site of Tell Tayinat in the later 12th century. Tell Tayinat, 25 kilometers from the Mediterranean coast, is situated on the Turkish side of the border, on the eastern bank of the Orontes river where it makes a turn to the west. Near lies Tell Atchana, the site of the city and minor kingdom of Alalakh, which was abandoned about 1200 BCE. It had came to existence after 2000 BCE, when the first settlement period at Tell Tayinat had come to an end. Alalakh has been widely assumed to have been destroyed by the Sea Peoples, but dates from Tell Tayinat put its re-settlement at around 1115 BCE so a direct connection between destruction of Alalakh and re-settlement of Tell Tayinat seems to be out of the question. As a reason for the incomers settling at Tell Tayinat, the rich agricultural resources of the area are likely to have been of greatest importance and control (if any) of the diminished trade through the area must have been of a secondary importance. The incomers produced Aegean-style pottery from local materials, had a combined agricultural and pastoral economy and seemingly mixed with the existing local population and were assimilated by them. It's possible they left behind them little except their genes, perhaps a small rudimentary polity and - most scholars believe - a name for the land that gives a strong hint of their origin. The name of the land was Palistin. Around 1025 CE Tell Tayinat was Kunulua, a flourishing capital of significant, growing Syro-Hittite state using the Indo-European Luwian language inherited from the Hittites - who had used it in their own public monuments - and with a king who embraced the symbols and traditions of the Great Kings of Hittite Hatti. It had eclipsed in power Aleppo, where the ruler of Kunulua placed his own image in a relief beside a Hittite-er image of the Storm God. This ruler was also possibly able to make Carchemish - the ancient city of Karkamish, and its dynasty of rulers descending from Hittite viceroys - a vassal; at least that is what he claimed. He was Taita I, 'the Hero and King of the Palistineans'. Taita might even have been a descendant of the Hittite royal house or their local vassals - the last known king of Nuhasse was called Tette - or perhaps he was a Hurrian as his name possibly hints. The Hurrians were a local people of significant antiquity, speaking a language isolate, who had had the major kingdom of Mitanni until it was taken over by the Assyrians and integrated to their kingdom first as a vassal state around 1330 BCE and fully by 1230 BCE. Hurrians' cultural reach had extended to southern Canaan, where a mayor of Jerusalem under the 'heretic' pharaoh Akhenaten around 1350 BCE had a Hurrian name and Hurrian gods were seemingly worshipped along with local Canaanite ones. There, in southern Canaan, at the same time as Taita I and his successors were extending their kingdom, flourished a group of coastal city states which the Egyptian pharaoh Amenemope(993-984 BCE) called 'the Land of the Philistines'; they are thought to have been descendants of the Sea Peoples, particularly of the Peleset, settled there by the pharaoh Ramses III(1184-1157 BCE) after he defeated a two-pronged Sea People attack both from the sea and the land. It is possible, but not likely, that the name of northern kingdom of the Palistineans, the kingdom of Palistin, had its origin from a Luwian source. More likely, it was the remnant of the population that had settled Tell Tayinat in the 12th century. Taita I might have been a fully assimilated descendant of those incomers; a representative of a hybrid culture and polity after their mixing with the existing Hittite, Hurrian, Luwian and local Syrian cultures and political and linguistic traditions. It might have been that the incomers, lacking appropriate traditions of kingship themselves, would have embraced local existing traditions of kingship from the surviving local polities that had emerged from the ruins of the Hittite Empire. Thus the core of the polity would have been formed by the incoming population, who would have - in the manner of many invaders throughout history - been 'conquered' by the higher culture of the existing local population. These incomers would have been closely related to the Peleset; in essence, they would have been Philistines. They could be called northern Philistines to separate them from those in Canaan, the southern Philistines. Philistines at the early Iron Age might not have meant a homogeneous ethnic group of people, but perhaps already a relatively heterogeneous group united (to some extent) by a shared culture and a language. It has been proposed that the Philistines in Canaan came from what became the kingdom of Palistin, but this is based on the possibility that the re-settlement of Tell Tayinat is older than existing evidence of Philistine cities in Canaan. Only further work can confirm or deny this theory of Philistine expansion to Canaan from Palistin, but more likely is that two different groups diverging from an original heterogeneous population settled both in Tell Tayinat and in Canaan and independently gave rise to the land of Palistin and the land of the Philistines, Palestine. Far more fantastical possibility would be that for some brief moment there would have been Philistine control of the coastal region from the Bay of Iskenderun down to Gaza and after it ended, these two separate regions would have been left behind. This is extremely unlikely. Considering the position of the Philistine cities in the coast of Canaan and the importance of urban centres of Palistin for trade, there would certainly have been trade and political contacts between them. It's unlikely that any idea of kinship or special connection would have long lasted the emergence of Palistin as a kingdom in the Syro-Hittite tradition, whatever the polity's origin, but there would have been exchange of not only goods but also culture, ideas and to a limited extent, people, as with other nearby areas. When a major discovery of this nature in the Near East is made in this timeframe, there inevitably follow attempts to connect them to places and figures mentioned in the Old Testament. The possible Philistine connection has naturally been fodder to many theories; in one of them, the weak memory of king Taita acts as a seed for the story of king David in the Bible, although the geographical areas were different. The kings of Palistin built the major temple of Ain Dara, whose ruins were recently greatly damaged in a Turkish air-strike. The temple of Ain Dara, according to 'biblical archaeologists', resembles the descriptions of the Temple in Jerusalem in the Old Testament and this and other evidence from the kingdom of Palistin has been used to argue for the existence of both for Taita as David and for separately for the existence of the biblical kings David and Solomon. In the latter theory, Ain Dara is positioned as a model, inspiration for the first Jewish Temple while a somewhat far-fetched speculation has tried to make Taita II, a likely grandson of Taita I or at least a ruler removed a generation from him, into an ally of David by identifying him with the biblical king Toi of Hamath. There seems no real evidence to call this more than speculation; Ain Dara or another temple like it in the Hittite tradition, might have simply been used as a reference of what a great temple should look like by the authors of the biblical text and the latter claim is based on little more than the fact that if a 'biblical kingdom of David and Solomon' would have existed in the extent imagined, its borders would have been close to those of Palistin / Walistin its own greatest extent, which included Hama(th). Written evidence for Taita II comes from somewhat north of Hama, in Meharde and Sheizar on the Middle Orontes. This king Taita is named with his mother or wife Kupapiya; mention of her probably signifies important role for her. Perhaps she came from an important dynasty (or a family in that particular area) and/or acted as a regent for an underage king. The apparent re-use of same names in different generations have created controversy of who did what; for example the archaeological evidence for Taita I and Taita II that we follow here is not the only possible and their activities could have been the other way around. Also the kings named 'Lubarna' in Assyrian sources might be called by the old Hittite title 'labarna' instead of their actual names; thus for example kings Lubarna I and Suppilaliuma II could be one and the same. In the citadel of Aleppo a panel of a king Taita, who had rebuilt the Temple of the Storm God, was found beside the god's image in 2003. If there are two kings of Taita, this panel would likely belong to the first, ruling around 1025 BCE. If there was just one king of Taita, it might be from mid- to late 10th century BCE. The date has importance considering the extent at different times of Palistin's political control, although in case of Aleppo it might have been indirect, perhaps hegemony instead of Aleppo being ruled directly as part of the kingdom. The Taita who left inscriptions at Meharde and Sheizar is now considered by many to be a different individual, Taita II. He would have likely been a grandson of Taita I or at least a ruler removed by a generation from Taita I. His reign is estimated to around 950 BCE or little later and under him the kingdom probably achieved its greater extent. By his time a linguistic shift has changed the first letter in the kingdom's name from 'P' to 'W'. This Taita II was thus a king of Walistin - which is one of the reasons why is considered a separate individual from Taita I. Whether this change happened in his generation or in the previous one is open; Suppiluliuma I, son of king Manana, is dated near to Taita II and calls himself 'king of Walistin' in his two stelae that have been discovered, but he might have ruled before or after Taita II. The importance of Suppiluliuma I lies in his traditional royal Hittite name. When the name 'Taita' is of origin of which there is almost as many theories as there are scholars, there is no obscurity in this name and its use is a clear claim to the memory and power of the fallen Hittite Empire. The enemies Suppiluliuma I claims victory over, the Hiyawa, where also perhaps those of the Hittite Empire of old - the Ahhiyawa. If so, this would place the must contested Ahhiyawa in Cilicia, where the discoveries of the two Arsuz stelae of Suppiluliuma I were made. Suppiluliuma I would have ruled from mid- to late 10th century BCE. If the origin of Palistin was Philistine, in the Suppiliuliuma I, king of Walistin, we have see the transition to Hittite kingship fully complete. During the following kings of Walistin, carrying traditional royal Hittite names, the kingdom lost its eastern and southern territories. From the 870s BCE onwards, the recovering Empire of Assyria started to recover its interactions (often hostile) with the kings of Walistin like Lubarna I(c. 870 BCE) and Halparuntiya / Qalparunda II(fl. 857-848 BCE), who were forced to pay tribute to Assyria. Although there is no good evidence that the kingdom and its inhabitants ever themselves called it anything but Palistin / Walistin, by the time of Neo-Assyrian Empire's rise its kings are called kingdoms of Patina / Patinu / Pattin or Unqi in Assyrian sources. Among these kings is the king Suppiluliuma II(c. 858 BCE), parts of whose grand but rather crudely made colossal statue, was discovered in Tell Tayinat in 2012. Overall in the sculptural arts in the kingdom the statues of animals, including royal symbols as lions, are to our eyes of greater quality. This particular statue was apparently buried after the Assyrians conquered the city and ended the kingdom's existence in 738 CE. It has been proposed that the name of the last king, 'Tutammu' in Assyrian sources, should instead be read Taita, which would show great continuity in naming (and thus, we can assume, in royal tradition) from the first known king to the last. Assyria had been able to interfere in the internal affairs of the kingdom of Walistin / Patina since around 831 BCE at least, when it had intervened to remove an usurper. Under Tiglath-Pileser III(746-727 BCE) who re-invigorated the empire and re-started its expansion, the weakened kingdom of Walistin / Patina ceased to exist and became the Assyrian province of Kinalia. Soon the kingdom's existence was forgotten, and only in southern Canaan did the name and memory of the Philistines give a lasting name to the land, which it carries to this day: Palestine. At the end, we return where we began, the quote from the German archaeologist Kay Kohlmeyr. According to him, it's dangerous to make historical connections that could be useful for modern Palestinians in their difficult circumstances. Kohlmeyer, aware of the find's political implications in a country with 400,000 Palestinian refugees, downplays the inscription's significance. "I worry that this could become a pilgrimage site for Palestinians." There has been many attempts to make these discoveries to support the Biblical narrative which is also the Zionist narrative of Israel. These attempts fail when looked at critically; the archaeological and written evidence of the kings of Palistin shows no political contacts with Palestine: Not with Philistine cities nor with any polity, mentioned in Bible or otherwise, if we dismiss the identification of Taita II with Toi of Hamath. So far the story of the 'northern Philistines' (if the people of the land of Palistin were such) seems to have taken place separately from those of southern Philistines and Palestine. The evidence of Palistin so far doesn't confirm or show wrong any part of the Biblical and Zionist narrative. Beyond the scholarly attempt to identify Taita I with David and the implications of 'David being Goliath', there has been no attempt to put the 'other Palestine' in service of the modern Palestinian narrative. Beyond the fact that it puts a stake through the heart of the silly Zionist hasbara claim that a state of Palestine can't be founded because it hasn't existed before (which would have made the founding of any state in human history impossible, because there would always have had to exist a state with the same name before) it has no direct connection; as far as Palestinian narrative claims Philistines as ancestors, the 'other Palestine' at most shows distant cousins one be a pit proud. But Kohlmeyer playing down the importance of the find in fear that it might interest Palestinians and become important for them is itself interesting: In effect its an act of censorship of anciest history based on the fear that a currently oppressed population might find it inspirational and claim symbolic intellectual ownership of it. It's in this that modern Palestine and the 'other Palestine' come together most importantly; the current oppression and marginalization of Palestinians must be extended through 30 centuries into a distant past, to a state because it likely had a name derived from the same people as modern Palestine. The Zionist project doesn't only try to colonize (and erase) Palestine both as a geographical and historical entity, removing it from existence both now and in the past; no, for the modern Palestine to be erased, the 'other Palestine' that existed 3000 years ago must be marginalized and, if possible, explained away. The Zionist project's demand for the control of history, both as record of events in human experience and as a scholarly, pursuit is complete. This reach has clearly reached Kohlmeyer and made him its pawn. Yet, we can note how strong the fear of the exiled, marginalized Palestinian refugee - living in poverty in a refugee camp in a foreign country - is in those affected by Zionism like Kohlmeyer, and how much of undiscovered power they believe to reside in the Palestinian refugee. Thus, like the slaves that were forbidden to learn to read so that they couldn't use education as a weapon to free themselves, the Palestinian refugee must be kept ignorant of those intellectual and historical tools that she could use to free herself. In this, the Zionists and those who accepted their view of the oppressed Palestinians, themselves make the long-lost land of Palistin important. Their fear of it offers a tool for the Palestinians in exile and under occupation. Without overplaying the kingdom of Palistin's connections with Palestine and the Palestinians, it can be used to oppose the Biblical narrative used to support the occupation, ethnic cleansing and annexation by Zionists and their fellow travelers, and to construct a counter-narrative which can be 'weaponized' to support the liberation of the occupied territories and the return of the ethnically cleansed refugees. Emanuel, Jeffrey P.: King Taita and his "Palistin": Philistine State or Neo-Hittite Kingdom(2015), in Antiguo Oriente, vol. 13(2015). Fridman, Julia: Riddle of the Ages Solved: Where Did the Philistines Come From? Sass, Benjamin: TAITA, KING OF PALISTIN: CA. 950–900 BCE? Google News has seemingly gone full White Nationalist - aka Fascist Racist, as they need to be called, centrist niceties aside - as it censors news about the 130th anniversary of the Thibodaux Massacre, the mass murder of 60 African-American labor union activists in Louisiana in 1887. Search 'Thibodaux Massacre' on Google News - nothing comes up. Make the same search for the last week on any major search engine, even Google's own, and see a large variety of articles from different mainstream sources. These mass social media corporations owned and run by radical rightwing libertarians from the United States have an agenda - and it's not pretty. This is nonsense, and its appalling how its gets reported uncritically. - The idea that the Pharaoh in Bible's 'Exodus' story was intended to be Ramses II has no support. It has become popular in biblical crackpot circles because he's famous, and then become 'accepted' in these pseudo-scientific phantasies by the weight of being popular. The biblical story has no details that could be connected to what we know from the real historical Ramses except that he was a pharaoh also. If we want to find models for the 'Pharaoh of the Exodus', and have any scientific credibility, we would look at what historical phraohs authors of the story could have actually used as models and then sculpted for the demands of their story; someone very close to the time of the composition of the story as an oral version and and then another one at the time of it being written down. - The idea that the biblical story represents a solar eclipse. That theory has been proposed before, but its a theory. As can be seen, the original text offers multiple ways of interpretation. The idea that there must be a real natural event to explain what is an event in a myth is something that we can't be sure of. The biblical story is not constrained by scientific facts, but only by the imagination of the people who came up with it. There is no archaeological or historical evidence for any part of it, and there is no astronomical either. The demands of the story decide how the event is portrayed, the story wasn't adapted to fit what we understands as scientific credibility. - Even if the story would describe a solar eclipse, it doesn't have to describe some particular historical eclipse. If we could be sure that it's a solar eclipse in the story, even then we could only know that the people who came up the story knew a such phenomenon existed; we couldn't know that they recorded a real historical solar eclipse instead of using an overall description of solar eclipse in what they came up with. The authors of the Exodus myth were not constrained by a real historical events; again, they were only constrained by their imagination. If they wanted to insert a solar eclipse in their story to create a dramatical event in the story, nobody would have said they couldn't do it. If they wanted to make a solar eclipse to last a day, again no one would among their peers or audience would have said them that real solar eclipses don't last a day. Myths and religious stories don't obey the rules of scientific writing. - Trying to fit Biblical stories into scientific frame to 'prove them' should be a thing of the past; when crackpot theories based on circular reasoning are reported alongside valid science, these Biblical phantasies get credibility that they don't deserve. I suggest people actually read the Exodus story and see it as the religious myth constrained only the imagination of their writers and the demands of the religion; the few most famous points that the biblical crackpot theories try to prove again and again have a multitude of other far-fetched points that go far beyond realism - I suggest, for starters, that you try to keep a record of the death toll for example. This is basically Liberal Zionist propaganda that blames victims for their own continued oppression while with barely concealed mirth celebrates 'Invincible Israel' as it makes token gestures to lament the situation which the writer thinks and clearly wants to go on. The very title plays to the Zionist mindset. Lets throw it to the trash bin where it belongs to - occupation, ethnic cleansing, Apartheid, mass incarceration - these are not "war". They are oppression, they are racial segregation, they are simply acts of ideological hate. Now, let's put forward a few simple facts: The occupation of what remains of Palestinians' lands is kept up only by the support and acceptance of the "West". The occupation - as does the siege of Gaza - will go on as long as the "West" allows. The day when it doesn't allow it anymore, it will stop. Currently it goes on because, firstly, "Western" media is utterly on Israel's side, hiding the reality of the occupation and Apartheid and simply refusing to tell news that are negative to Israel; increasingly "Western" media just cut and pastes what Israeli authorities tell them. As an excuse "Western" media tells us that Israel wouldn't allow its reporters in Israel or occupied territories at all if it wouldn't report what Israel tells it to report; the claim is that propaganda for the occupier is better than reporting from a distance. Secondly "Western" politicians think that their careers and the success of their parties' depend on doing Israel's bidding. This is largely based on antisemitism, the idea of Jews - and to "Western" politicians all Jews are Likudniks - controlling media and the financing of those political careers. "Western" companies making profit out of the occupation also finance these politicians, who then loudly oppose BDS. The importance of BDS is not, at this stage, of making serious dent to occupation profiteering: It's still ground-work for that, winning the fight for the right to boycott in the first place and making the boycott movement known. In the end, Israel is doing suicidal things which the Liberal Zionist writer doesn't mention - it's regime is deliberately attacking and alienating not only its Palestinian but the Druze minority also. Increased destruction of homes and entire villages, taking of citizenship even from those who have served in Israel's occupation forces while leading Israeli politicians openly favour ethnic cleansing of Palestinians with Israeli citizenship without condemnation. Since 1960s Israel has tried to isolate Arab communities in Israel from each other so that they wouldn't form large continous areas that might be eventually returned to Palestinian political control. Now Israel increasingly attacks those communities and there is no realistic way to separate more than a tiny part of them from Israel and to keep any kind of geopolitical coherence. British police are re-opening the unsolved murder case of Palestinian cartoonist Naji al-Ali, who was shot in London, Great Britain on July 22nd 1987 and died of his wounds on August 29th 1987. When he was shot, Naji al-Ali was walking to the London offices of the Kuwaiti al-Qabas newspaper. He had left his car nearby and had made his way on foot to the St Ives street in Chelsea when he was attacked at 17:10 local time. The man who shot him had been following him for forty seconds according to eye-witnesses. The killer, a 'Middle Eastern looking" man of about 25 years of age seemed to have an accomplice. This accomplice was another "Middle Eastern looking" man in his fifties. The sources differ at this point: Either the accomplice alone or with the shooter escaped in a "silver Mercedes". In some sources the the killer himself escaped on foot, while the accomplice took care of the gun. The gun, 7.62 millimeter Tokarev - originally produced in Soviet Union but later made in many countries - was found in 1989. During the original investigation the British police arrested in Hull a Palestinian student named Ismail Sowan(b. 1959), on whose possession was found arms and explosives. Under interrogation Sowan claimed that he was a Mossad double-agent inside PLO. He claimed Mossad had recruited him as a teenager in 1977 in the occupied West Bank and told him to join PLO. Sowan claimed that he learned about a plot to kill Naji al-Ali and had informed his handlers in Tel Aviv. He was sentenced to eleven years in prison for possession of explosives on November 2nd 1988. Sowan was released early in 1994 and deported to Jordan, whose nationality he held. The lack of further arrests based on Sowan's claims have never been explained well. A second person claiming to work for Mossad was also arrested, but not charged. Naji Salim Hussain al-Ali became a refugee when his own home village of Ash Sharaja (where he was born in 1936) was destroyed by the Zionists in 1948. Nowadays on its ruins stands an Israeli town called Ilanya. His family ended up living in Ain al-Hilweh refugee camp near Sidon in Lebanon, and later al-Ali also lived in Shatila refugee camp in Beirut, working first at orchards and then as car mechanic, living two years in Saudi Arabia. in 1960-1961 he was part of a group producing a sort-lived political journal "Sarkha"("Cry!"). During his time he was arrested for political reasons by the Lebanese government. 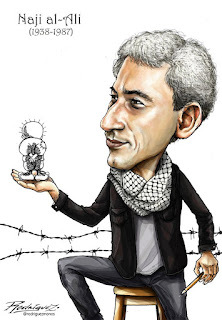 Naji al-Ali's first cartoons were published in 1961 by fellow Palestinian left-wing intellectual, author and revolutionary member of PFLP Ghassan Kanafani(1936-1972), who was murdered with his niece by Israel with a car bomb in Beirut. In Naji al-Ali's cartoons Handala witnesses the crimes of Israel, the sufferings of the Palestinian people, the duplicity and avarice of corrupt Arab leaders and the use of religion to silence voices of women. Handala has also become a symbol of the BDS Movement, which seeks the end of the occupation, equal rights for Palestinian citizens of Israel and a right of return to the refugees through peaceful means: Boycott, Divestment and Sanctions. In his exile that would last a life-time Naji al-Ali produced 40 000 cartoons. In 1988 the International Federation of Newspaper Publishers gave him posthumously the Golden Pen award, declaring him to have been "one of the best cartoonists since the 18th century". The British media back in 1987 and still now in 2017 have tried to mention Israel as little as possible in their articles. Which, in itself is telling. What is not said or seen is often as important what is. Instead of Israel we see BBC back in 1987 and now in 2017 blaming - based on unnamed "Middle Eastern commentators" (read Israeli media, politicians and the handlers of BBC journalists and executives) - Iran's Ayatollah Khomeini, "Arab states", "a Kuwaiti gang" and PLO. Instead of Israel - bane of Palestinian intellectuals and cartoonists then and today - BBC and rest of the British media want to plant in their audience the idea that either Palestinians killed their greatest cartoonists who gave voice to the refugees' plight or that it was otherwise a case of "Arabs killing Arabs". This doesn't mean that Israel necessarily did kill Naji al-Ali, but it does show how the British media wanted and did avoid bringing that possibility up, back in 1987 and now. Instead the British media has spent thirty years running defensive action for Israel whenever Naji al-Ali's murder comes up. Perhaps some authoritarian Arab regime killed Naji al-Ali, perhaps some "Kuwaiti gang", but what is clear is that BBC, The Guardian and the rest very much suspect that it was Israel who did it based on their reaction. The reaction of the British state itself is telling; if Naji al-Ali would have been killed by Iran, PLO or any Palestinian faction or at least there being any real evidence of the sort - then Great Britain would have taken all possible political advantage of it. Not to speak of Israel's regime, which would have exploited Naji al-Ali's death at the hands of anyone but itself to the fullest. Other possible culprits brought up have been the Phalangists of Lebanon - still the darlings of the "West" as "anti-Iranian reformers" - who were then allies of Israel. In 1982 the Phalangists massacred up to 3500 Palestinian refugees in the Sabra and Shatila refugee camps while Israel's army besieged the camps. It was threats from them which had in 1983 made Naji al-Ali to move from Lebanon to Kuwait, from which he was forced to leave not because of "a Kuwaiti gang" according to himself, but pressure from Saudi Arabia, another favourite of the "West". The saying "revolutionaries never die" holds true of Naji al-Ali also; he was a committed left-wing revolutionary who used art to fight for his people and for a better world overall. Pen was his weapon. It's not widely known especially in the "West", but cartoon is a popular and respected genre among Palestinians, with cartoonists giving voice to the feelings, yearnings and disappointments of the people. Israel fears these modern sons and daughters of Naji al-Ali, who have picked up and multiplied his pen, and through whose work Handala too still shares and witnesses in the tribulations, sufferings and victories of the Palestinian people. Just recently, amidst the fighting against extremist Islamists in Ain al-Helweh refugee camp in Lebanon, an art exhibition made by local Palestinian refugee youths was opened in his honour. In his childhood Naji al-Ali had lived his family in Ain al-Helweh. Whoever shot Naji al-Ali, and the ones who send him to kill him, failed. We hope that they can bring to justice, as remote as that chance has been, but they have already been defeated. Who killed Naji al-Ali, Palestine's most beloved artist?